Team sheets will be released at approximately 6.30pm AEST today, with The Traders reacting LIVE on the Official AFL Fantasy Facebook page from 6.05pm AEST! In the meantime we’ll be updating all the news and rumours here, so if you’ve heard something on the grapevine feel free to tweet at me (Oh by the way I’m Ollie, hi, nice to meet you!) or use #AFLFantasy and I’ll find it eventually! Kade Simpson (DEF, $686,000) is back in, reverse those trades! Jack Macrae (MID, $817,000) is also back but with a breakeven near 200 I wouldn’t be jumping on just yet. Toby Greene (FWD, $643,000) falls into the same boat, watch and wait for him to find some form before considering. Jake Waterman (FWD, $346,000) is back for the Eagles but coaches should look to move him on ASAP as his price is on the slide. Isaac Heeney (FWD, $630,000) returns after missing one game with a concussion, I would wait a week on him as well, if not two. Finally, we have some new rookies this week. Colin O’Riordan (DEF, $170,000) scored 169 Fantasy points in the NEAFL last week, and Alex Morgan (DEF, $170,00) has had some strong form in the VFL. Of the outs, Logan Austin (DEF, $408,000) and Andrew Brayshaw (MID, $466,000) are injured and should be moved out of your side. And an annoying blow for some coaches that targeted him as a POD, Marcus Bontempelli (MID, $587,000) is out after an appendix surgery. 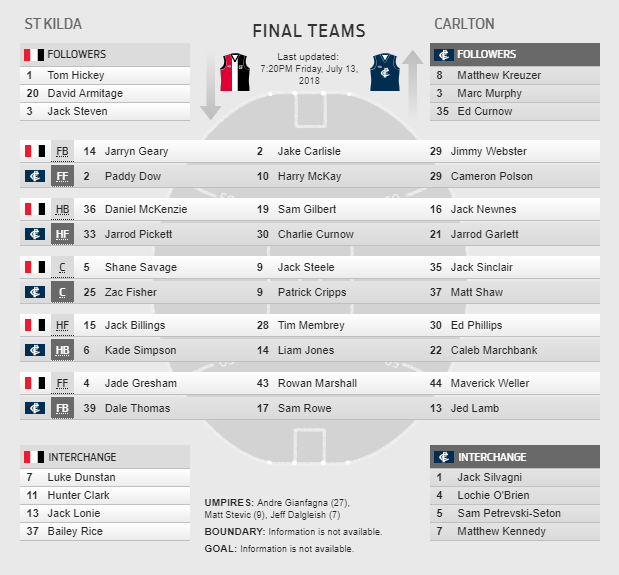 St. Kilda: Jake Carlisle, Rowan Marshall, Tom Hickey, Jack Lonie, Ed Phillips, Bailey Rice. Carlton: Kade Simpson, Jarrod Garlett, Paddy Dow, Harry McKay, Matt Shaw. Hawthorn: Brendan Whitecross, Tim O’Brien. Melbourne: Bernie Vince, Jay Kennedy Harris. 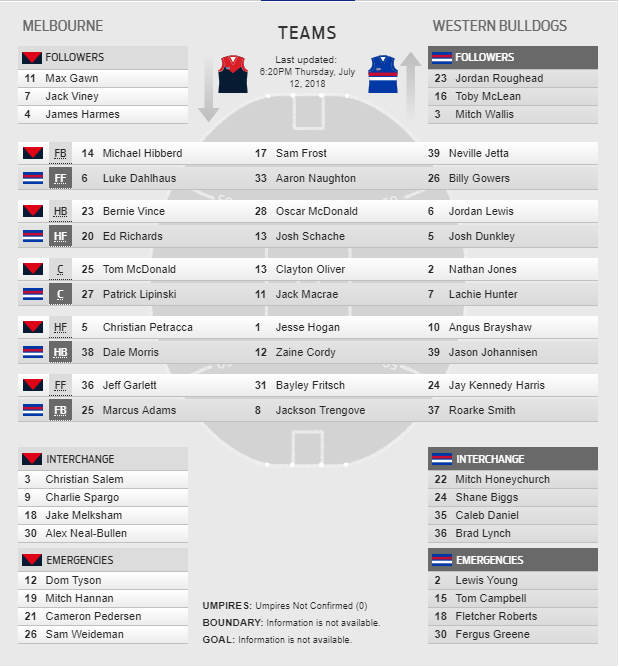 Western Bulldogs: Jack Macrae, Jordan Roughead, Mitch Honeychurch. GWS: Adam Kennedy, Jacob Hopper, Toby Greene. 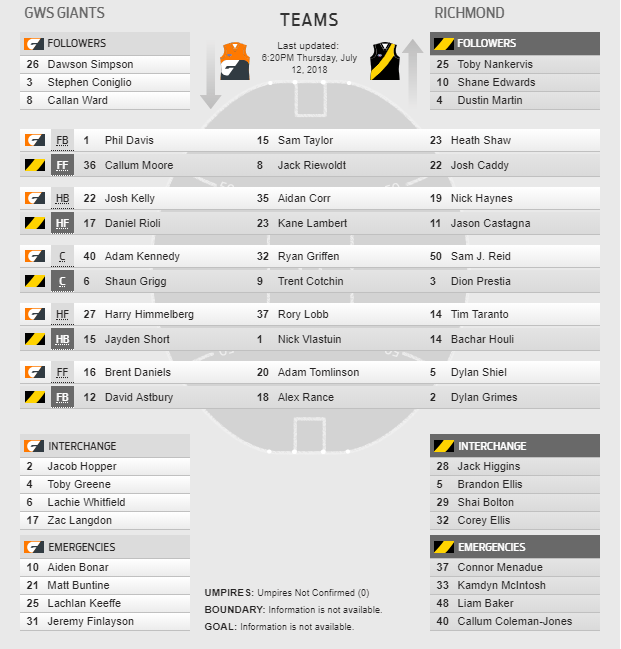 Richmond: Nick Vlaustin, Bachar Houli, Shai Bolton. Essendon: Orzaio Fantasia, Matt Dea, Darcy Parish. Collingwood: Travis Varcoe, Darcy Moore. West Coast: Jack Darling, Mark LeCras, Josh Kennedy, Jake Waterman. 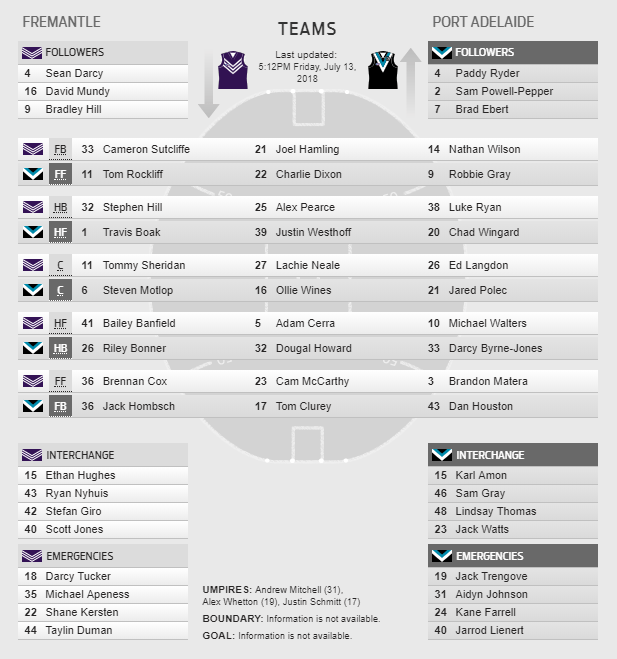 Fremantle: Scott Jones, Ryan Nyhuis, Cameron Sutcliffe, Cam McCarthy. Port Adelaide: Jack Hombsch, Karl Amon, Sam Gray. Sydney: Tom Papley, Isaac Heeney, Nic Newman, Colin O’Riordan. 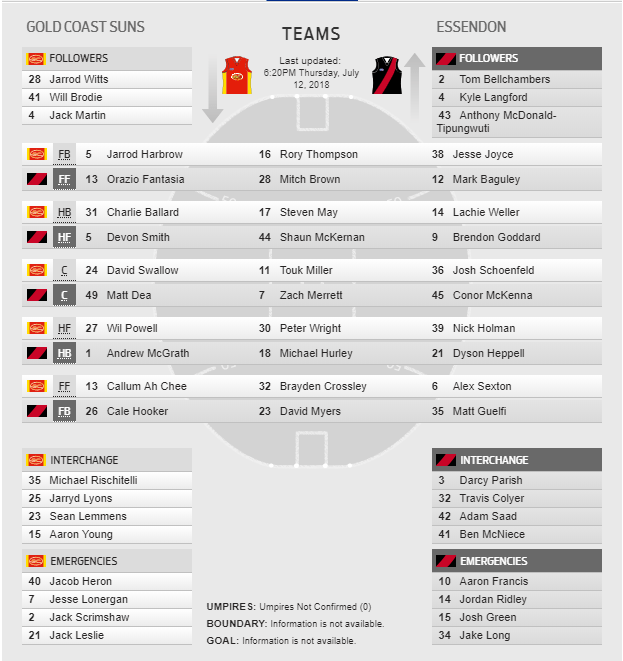 St. Kilda: Paddy McCartin, Billy Longer, Darragh Joyce, Nathan Wright, Logan Austin, Seb Ross. Carlton: Jacob Weitering, Matthew Wright, Nick Graham, Andrew Phillips, Darcy Lang. 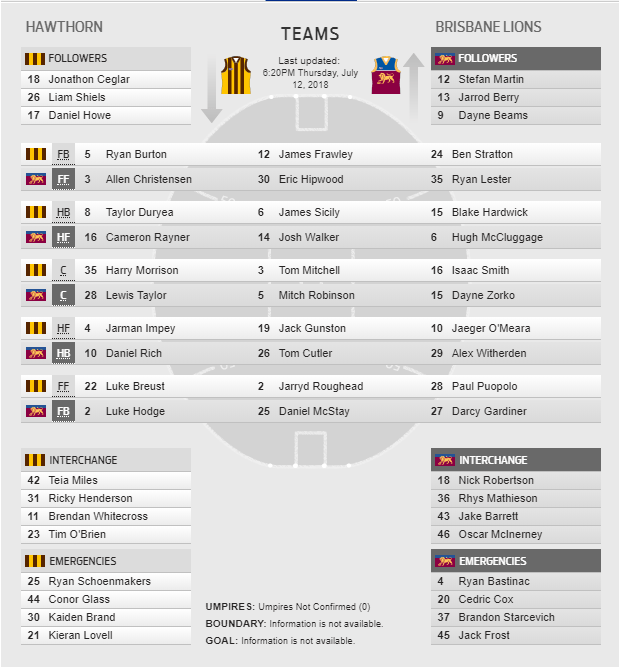 Hawthorn: Ben McEvoy, Jonathon O’Rourke. Melbourne: Joel Smith, Billy Stretch. Western Bulldogs: Marcus Bontempelli, Hayden Crozier, Tom Boyd. GWS: Harry Perryman, Jeremy Finlayson, Matt de Boer. Richmond: Dan Butler, Jack Graham, Nathan Broad. Essendon: Jake Stringer, Patrick Ambrose, Jake Long. 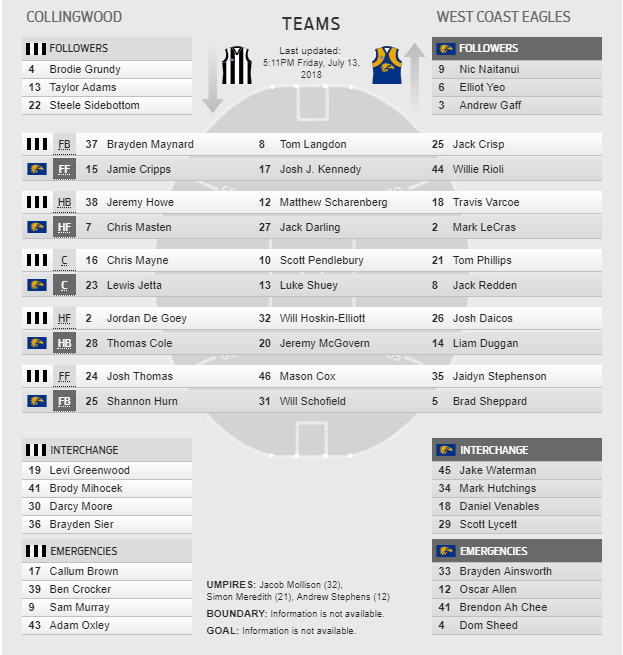 Collingwood: Flynn Appleby, Ben Crocker. West Coast: Nathan Vardy, Brayden Ainsworth, Brendon Ah Chee, Oscar Allen. Fremantle: Andrew Brayshaw, Darcy Tucker, Michael Apeness, Shane Kersten. 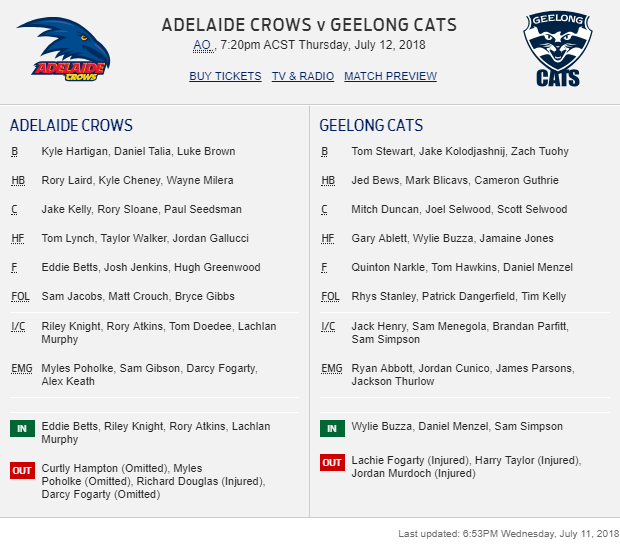 Port Adelaide: Tom Jonas, Jack Trengove, Aidyn Johnson. Sydney: Dan Hannebery, Kieren Jack, Jarrod McVeigh, Dean Towers. Hi Ollie, cheers for doing the team sheets – looking good so far! We’ve been fairly lucky to avoid major carnage lately and haven’t heard any rumours so far this week so fingers crossed we don’t get any curve balls tonight! GREAT job mate, the team sheets were dearly missed since Shags and you’ve done just as good of a job. Thank you! What a very much appreciated early opening of the Team Sheets and an excellent pre-team drop summary of what to expect. All this made available at 3.43pm Thursday. This is as good an opening of Team Shhets as it could get. Thanks. Hope the team drops are able to be announced here in parallel with the Traders live session. All the very best in stimulating the discussion here Ollie. Your effort seems inspired. Again, thanks. Hey thanks for the feedback! I’m a bit of a slowpoke so I like to organise things in advance…I doubt I’ll ever have the teams dropping here at EXACTLY the same time as the podcast, but I’ll do my best! I’d personally go with Beams purely because of his recent form. 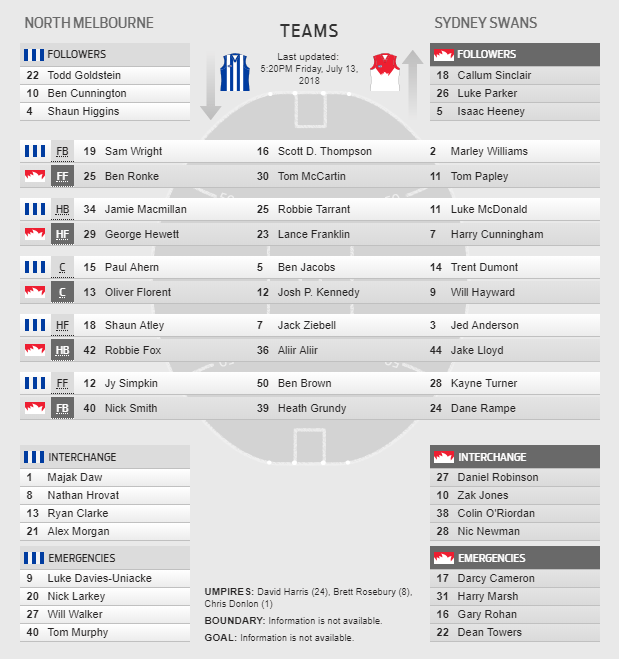 Hi Guys.. Heppell & Laird OR Crouch & Whitfield? Sadly can’t quite afford Laird and Crouch. Who do I trade out of E.Phillips, Seir and Giro? Wow, no green lights for players who have been selected… til after partial lockout. No, not surprised… but it must be up there with their best fails. How could they not know? You can use any line for placing a non-playing captain and reallocate the C off from Tich. Who do you have currently on the bencheach of each line that is not selected? I VC’ed Danger and had Tich as captain. Am now putting Flynn (Ruc) who is not selected on the field, and placing the ‘C’ on him and S.Martin on the bench (with the ‘E’ on him). Do you have something like that? You would be stiff if you had no options. 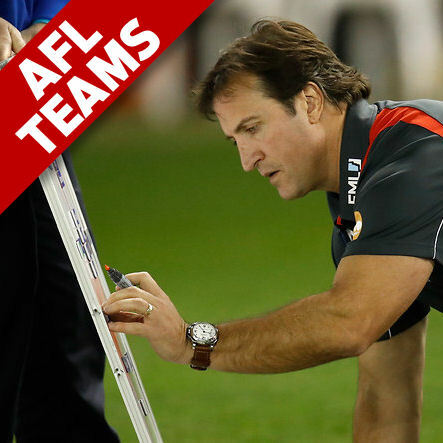 Redman would be the ideal candidate – ruled out for the rest of the Fantasy season. Then guys like Joel Smith or Austin, who are listed as injuries for this round but it is unclear how severe those injuries are – i.e., they are unlikely to be brought in as a late in, but statistically more likely than Redman. I wouldn’t risk playing Russian Roulette by putting the C on someone like Darcy Cameron or Sier, who are still in the extended squad. Took Danger as vc last week. One week too early. Thank you :) Will hopefully get better the more I get used to it!